What do Bicycle Karma, Snowshoe Karma, Pack Karma, and Sailboat Karma have to do with Carburetor Karma? It's a very long story that began in early November 2007 and continues today. After we moved to Idaho Falls in August 2007, our first efforts were to find a home, settle into a new job and get comfortable living in a city. Much of the above was accomplished by early November and, as my 60th birthday approached that year, my thoughts turned to a whimsical desire--a bicycle. Yes, I wanted a bicycle for my 60th birthday. So I began looking at Craigs List every day in hopes "the right bicycle" would appear. Sure enough, a few days before my November 21st birthday, a great ad popped up. I swapped emails with the seller and he checked out. He said the old classic mountain bike was thoroughly rejuvenated and that he had gone through everything to make sure it was in tip-top shape. He wanted $60 which was (and still is) a very fair price for the bike. We agreed to meet the day before my birthday--November 20th--on a very cold but very bright sunny day at the Idaho Vietnam Veteran's Memorial in Freeman Park. The Memorial sits on a high knoll overlooking the Snake River. It is a beautiful and somewhat haunting spot. I dutifully went to the bank and procured three $20 bills. We both arrived in the parking lot at the same time. I was relieved to see The Stranger was a very nice man with a very nice bicycle. He urged me to ride it around. It was perfect in every way. I returned to his vehicle and pulled out my $60. He looked at me with this strange look on his face and in his eyes. There was a long pause. He said, "Have you ever heard of Bicycle Karma?" I stammered a little bit and said, "I think so." His piercing eyes riveted onto my eyes and he said, "I am in need of some Bicycle Karma today and so this bicycle is yours. I don't want your money. You can keep the bicycle and your money." Well, naturally, I was shocked, stunned and rendered speechless. Such a thing had never happened to me before. I tried to insist that he take my $60 but he very politely and kindly declined. He said, "You see, I have a need for Bicycle Karma today and therefore I cannot take your money. But for me to receive my Bicycle Karma, you must be so kind as to take my bicycle." My Heart was filled with overwhelming emotion and I thanked The Stranger profusely. We shook hands and smiled and we each went our own way. As I drove home from that cold, sunny knoll, I cried tears of joy and happiness all the way home. When I arrived home, I could barely tell Susun what had happened because it is very hard to talk when one is choked-up. It was easily the Best Birthday Present I have ever received from a Stranger. Even today, almost seven years later, my Heart swells with emotion as I type these words. I really can't convey the impact of those moments on that day before my 60th birthday. Memories of The Stranger's Bicycle Karma Gift will live with me forever. I loved my new bicycle and I still have it. I will never part with it because it is a part of me. A few weeks passed and, on a wind-whipped snowy day four days before Christmas, the phone rang at my office desk in an old downtown Idaho Falls building. It was The Stranger. He said, "I've been thinking and I think that bicycle I gave you is lonely. It needs a mate and I need some more Bicycle Karma. I have another bike I want to give you." Well, as you might expect, I was shocked, stunned and speechless. I stammered a little bit and said, "So what do you have in mind?" The Stranger said to meet him in the Wal-Mart parking lot at lunch time. So, I drove out in what had since become near-blizzard conditions to meet him. He pulled out a brand new, name-brand women's mountain bicycle from his van. It looked like it came right off a showroom floor. I simply couldn't believe it. I kept saying, "But you must allow me to pay you for this wonderful bicycle!" And, just as he had done before, he fixed his riveting eyes on me and repeated in a kind and caring manner, "No, you see, I am in need of some Bicycle Karma and the only way I can obtain it is for you to take this bicycle and enjoy it." Once again, we shook hands and each departed into the swirling snow. Once again, I cried tears of happiness and joy all the way home. Once again, I could barely talk to tell Susun the story of her new bicycle. Time passed. Somehow I had obtained the email address of The Stranger that snowy day. One day I shared a thought that it seemed impossible to find and buy a pair of used snowshoes in Idaho Falls. Of course, that is when The Stranger decided he needed some "Snowshoe Karma." Yep, you guessed it, The Stranger began bestowing us with pristine pairs of snowshoes. As the time in early 2008 began to pass, it seemed that The Stranger would suddenly show up in our life, even when we were far from home. It began to feel like an episode from The Twilight Zone. It seemed no matter where we went, there he was. In talking with him, I deduced he really wanted a special backpack so that he could carry his daughter's snowshoes as they trekked from a parking lot to a trail. So, I went out and bought a brand new such pack. And I called up The Stranger at his place of work and said, "Mike, I am in need of some Pack Karma. Could you please come to my office at lunch time today?" Of course, he obliged. By this time, all my co-workers knew the Bicycle and Snowshoe Karma stories so they all assembled in the office lobby for Mike's arrival. Mike blushed quite a bit when he came through the door. Everyone clapped and cheered as I presented Mike with his pack. He unzipped the pack right then and there and the note I prepared fell into his hands. He read it aloud. "As You Pack Your Karma, So Shall You Wear It." We could all see a mist in Mike's eyes as he read those words and we all clapped and cheered again. Mike and I hugged there in the lobby and we have been Dear Friends ever since. Our Friendship blossomed to include his Loving Wife, Camille, and Wonderful Children, Chance and Madison. We enjoyed many happy times together. Mike's Life underwent many very stressful changes and his job was eliminated. He had to move far out-of-state while his wife and children tried to make do in Idaho Falls. Eventually my emails went unanswered and Mike faded into obscurity. Susun and I talked often about Mike and his Family. We often wondered what happened to them. We wondered what they might be doing and where they might be. I often felt saddened that our splendid relationship had suddenly vaporized. Alas, that is the way Life goes sometimes. And so it was the other night I was surfing the East Idaho Craigs List and I came upon an ad that captured my Heart. It was a sailboat and I instantly decided it had to be MY sailboat. Oh, how I lusted for this sailboat. I swapped a bunch of Facebook Private Messages with a Dear Facebook Friend lamenting how impractical it was to lust after a sailboat. 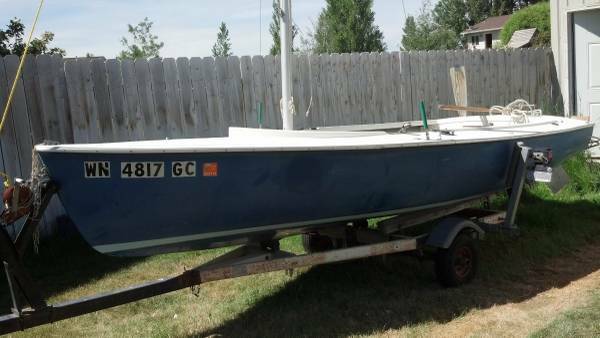 Finally, I could stand it no more and sent a reply through Craigs List to the seller asking a few basic questions about the sailboat. Who should answer but my Dear Friend, Long Lost Mike! Oh, My Gosh! I nearly flipped out! Not only did he answer but he answered from Idaho Falls! YES! Mike's back in town. Well, anyway, that was the Sailboat Karma part of this story. As Mike and I began to swap emails and get reacquainted, I told him about Marvie's Carburetor problems. Well, as chance would have it, Mike is a brilliant certified engineer and ALSO, a Carburetor Genius. I told him I would pay him to help me with Marvie's Carb but Mike needs some Carburetor Karma so he's coming over Sunday morning to rebuild Marvie's carb. Yes, I have the rebuild kit in my possession and, yes, this is really happening. When Marvie comes back to Life, it's going to be Karma. It's all about Karma...and bicycles, snowshoes, packs, sailboats and carburetors. I've been dubious about the idea of Karma, but after reading this I will have to change my mind! What a story! Whoa! Can't believe it. What a story. What a story.